← Why not declaw cats? I took two kitties to Dr. Hammerele at The Pet Doctor today in O’Fallon to have their poor declawed feet examined. 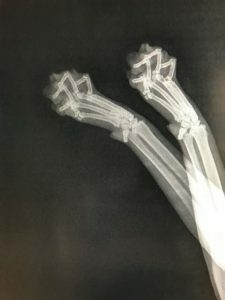 The first cat (where both paws are in the radiograph) has tendons so severely contracted, her toes have curled over. No wonder she is obese – it hurts so badly to walk! The next photos show bone fragments in most of her toes. This is like if we had a piece of glass in our shoe and it stabbed us every time we walked. Both kitties have surgery scheduled and are on pain medication and anti-inflammatory meds. 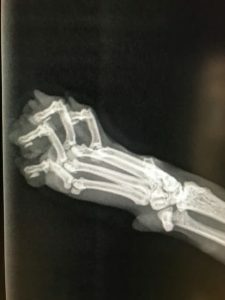 Declawing does not save cats’ lives – it only makes their lives painful! 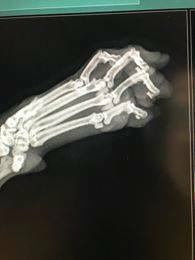 Declawing does not keep cats in homes – one of the cats I took today is from a rescue! Also, good to note that neither of these cats had any outward signs of pain or typical issues. No biting or aggression or litter box aversion. One cat is just painfully shy and withdrawn while the other is morbidly obese. Pass this along and spread the word about The Paw Project. What Ms. Ward says is terribly accurate. Touching on her comment about declawing keeping the cat in the home….Over the past week or two, I have seen at least a dozen postings from several rescue groups in the area, where, an older cat has been dumped at the pound, after being declawed. This Evil causes me to see red, and I fear I am going to have to go do some Tai Chi after putting this entry up, to regain some calm and balance. Her point about cats being spookily good at hiding disability is right on the nose too. I have had cats in the past that seemed healthy and hale, and were running around like kittens, then, either died in their sleep that night, or simply keeled over dead. I have had cats that had painful joints, and hid it from me for weeks to months. They are predators, after all, and in the world where they are not protected, any sign of weakness or disability is license for them to become the prey. In the Bible, which contains much wisdom about ethical behavior, in Mark 25:40 it is written “And the King shall answer and say unto them, Verily I say unto you, Inasmuch as ye have done it unto one of the least of these my brethren, ye have done it unto me.” If you are considering having a cat declawed, then think long and hard on doing this…and read the quoted verse a number of times! As I have mentioned before, there are several viable alternatives to deal with scratching. Do not have a cat as a companion animal. Get a dog. Get a fish. Get a plush toy. Just do not get a cat. Trimming the tips off the cat’s nails will eliminate many of the problems. It is easy to do, and painless. Take your cat to a professional groomer and have nail covers applied. It is possible to do it yourself, but initially, let the pro do it. They will likely have better product at hand, and will be less likely to screw up this somewhat fiddly job. This entry was posted in Ethics, Heath, Humanity, Nuttiness, Questionable decisions, Ruminations, Snake Oil and tagged cats, De-clawing, disability, pain, physical issues. Bookmark the permalink.